Unlock your business information with Powerful Business Intelligence provided by getsix. Accessing the right information at the right time can be a challenge. Individuals, teams, and organisations rely upon up-to-date information and data to effectively plan, monitor, report, and forecast for the future. With Business Intelligence knowledge is power and time is money. So how can you have an insight into your business performance, view the areas that are providing real benefit so you can focus on the areas that are underperforming and costing you money? Business Intelligence is a platform consisting of data infrastructure and collaboration tools of other applications such as Microsoft Dynamics, Microsoft Office, SharePoint Server, and SQL Server. Business Intelligence provides a comprehensive end-to-end solution that assists in driving your business forward, helping to provide an overall view of your organisation. Business Intelligence enables you to access the right information at the right time, and effectively analyse the data in order to make better informed business decisions. This business solution enables decision-makers across your organisation to effectively consolidate data from disparate systems into dashboards, making it easy to identify trends, review performance, and understand key areas for business improvement. Abraham Maslow was once quoted as saying “If you only have a hammer, you tend to see every problem as a nail.” Those words are truer than ever before as an increasingly complex and interconnected world makes selecting the right Business Intelligence (BI) tool crucial. Businesses, in an effort to stay one step ahead, collect large amounts of data ranging from demographics, buyer behavior, and customer loyalty to financial and operational data. Unfortunately the data is useless for decision making, its intended purpose, without a way of organizing and displaying it as meaningful information. To help digest and make sense of their data, companies need to select the proper tools that can collect, process, and present data in a relevant and timely manner. 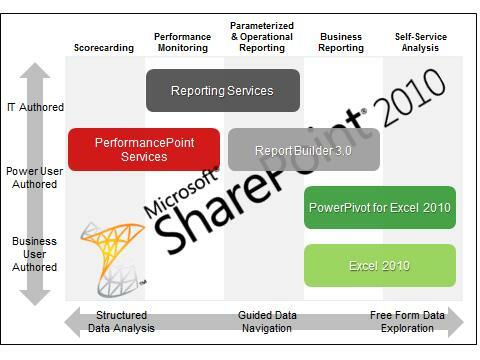 Microsoft provides a variety of tools that can address a broad range of BI styles, including Microsoft Excel, PowerPivot for Excel, SQL Server Reporting Services (including Report Builder), and PerformancePoint Services in SharePoint. All of these tools can be surfaced through the familiar SharePoint Server interface. Self-Service Analysis – Self-Service Analysis describes free-form reporting and analysis by users so that they can integrate data from disparate sources and drill-down and understand the root cause for data anomalies. These non-technical users value the ability to perform their own reporting and analysis without relying on IT or others. Business Reporting – This style describes formatted reports that are created by advanced business users or analysts. Reports are typically based upon approved corporate data, and then shared more broadly with managers, teams, or departments. In this style, IT involvement is moderate, usually overseeing the distribution and monitoring of the reporting environment and building of the structured data layer upon which the reports are built. Parameterized & Operational Reporting – Similar to the Business Reporting style, Parameterized & Operational Reporting is also characterized by fixed-format reports. The reports, however, are authored and managed by IT instead of business users and usually follow a pixel perfect format and rendering style. Consistency, scalability, manageability, and automated distribution are some of the key characteristics of this style. Performance Monitoring with Dashoards – This style describes dashboard-style reports that allow users to quickly and easily monitor the performance of their business. This style is catered to executive level or department leadership who require at-a-glance visibility on the health of the business, but it often also permits further investigation via interactivity. Scorecarding – Scorecarding is a style that describes highly summarized views with Key Performance Indicators (or KPIs) measured and scored against predefined targets such as a balanced scorecard. This style is generally a part of a performance management program, though it can also be used to measure operational performance. In today’s fast paced and ever changing world, organizations have a need to provide the right information to the right person at the right time. Doing exactly that is a fundamental promise of a BI program; however, if the delivery mechanism is not properly aligned to the information consumption and analysis needs, any solution is in danger of missing the mark entirely and failing to provide the anticipated value. Microsoft provides a variety of BI tools that fit a variety of situations. The figure below is a simplified guidepost for the reader that is seeking a final rule-of-thumb summarization of the “best fit” technology for each style. 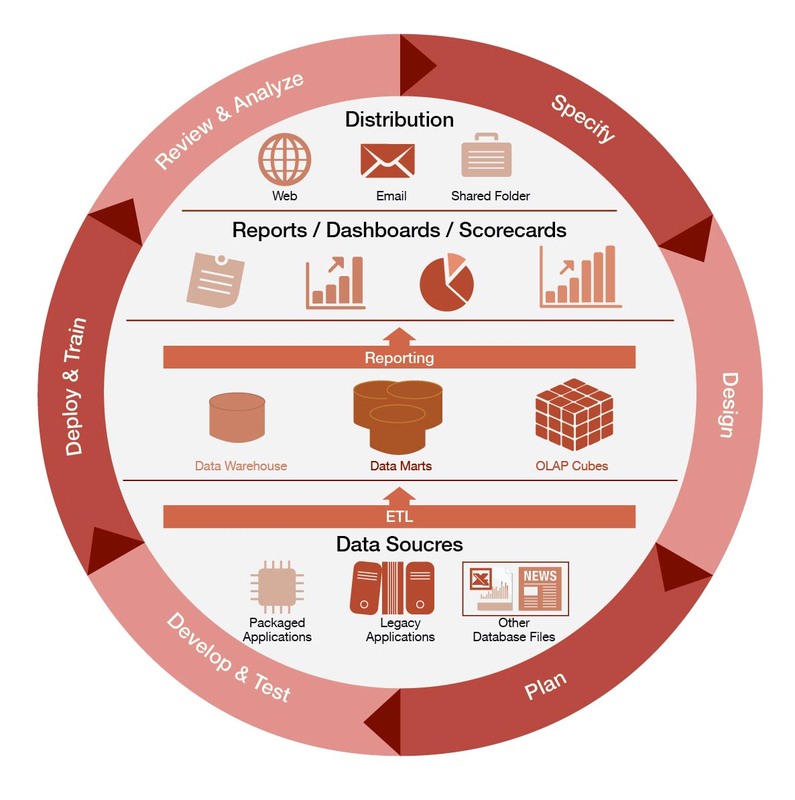 We convert your complex data and standardize disparate systems to yield actionable insights. Fierce competition is making enterprises think beyond squeezing more efficiencies and productivity gains from operations. This is pushing enterprises to make informed and timely decisions, which requires breaking the information silos and getting a real time view of entire operations. getsix help enterprises gain the right Business Intelligence quotient and transform volumes of data into decision drivers. Our team of experts weaves a ‘Web’ ensuring seamless integration of functions and data movement around business functions to provide actionable intelligence. Our Business Intelligence approach invests across BI suites. Our cohesive solution approach governs the complete life cycle from strategy to implementation and stabilization state.